Vote for SNSD as the #1 K-POP Girl Group on MNET’s Global Poll! 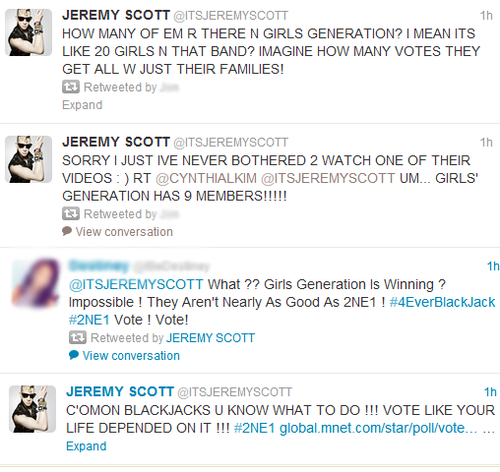 Fashion designer Jeremy Scott opened his big mouth on Twitter Wednesday to voice his displeasure over Girls’ Generation winning MNET’s Global K-Pop Star poll. He disrespected them, and if you don’t like his ignorant tweets, let him know about it by voting for Girls’ Generation on MNET’s Global Poll. Remember folks: Classy beats Trashy. Don’t spark fan wars or you’re no better than Mr.Scott. Let the votes speak for themselves. UPDATE: Poll is over. Girls’ Generation won! SoshiCast Shootout’s where we discuss SNSD topics without the fluff. Also where the staffers yell at each other. Press Play on the video player to listen in! Warning: Language will not be suitable for Minors. Hyoyeon: Dancing with the Stars – Getting Better or Worse?